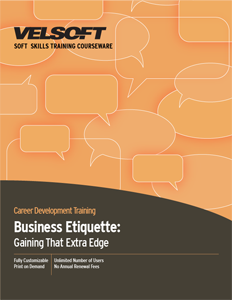 Business Etiquette Training Material is designed for developing proper business etiquette. Train your employees and managers how to conduct business while understanding multicultural differences. Teach topics such as proper handshakes, dressing for success, table and phone etiquette, how to develop the skill of small talk and more! Seeing is Believing This sample manual to teach Business Etiquette is in MS Word format. Do you have students wondering how to avoid sending and offending in their business e-mails, or who dread the thought of business lunches, telephone calls, or exchanging business cards because they're unsure of how to act? Business Etiquette: Gaining that Extra Edge is a one-day course that teaches students how to behave professionally and confidently in all of their business interactions, from business phone etiquette to which fork to use for their salad at their next luncheon. How to dress professionally, respond to e-mails politely, shake hands, exchange cards, and network are all included in this training material. Business etiquette trainers are provided with fully customizable training material, including an instructor's guide, student manual, course assessments, activities, and more. Instructors can also combine their workshop with eLearning, a blended learning solution that enables students to study their etiquette techniques independently. There's no reason to let your career be held back by not knowing what to do! Get etiquette training now and start refining your professional image today.